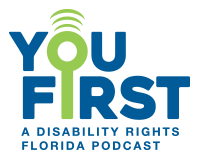 The purpose of You First is to discuss the rights of individuals with disabilities, putting your rights first. Host Keith Casebonne tackles important issues with knowledgeable guests, accounting first-hand experiences and discussing available resources for persons with disabilities. Episode 1: Your Vote is Important! An in-depth interview that will educate listeners about the importance of voting and general accessibility issues voters may face, as well as legislation and resources available to support voters with disabilities.